Who really was behind the SOPA protests? Numerous sites across the Internet are going dark today in protest of the SOPA (Stop Online Piracy Act) legislation currently before the House of Representatives, and the PIPA (Protect IP Act) legislation before the Senate. Google, Reddit, Boing Boing, and others are protesting the bills not because those sites support piracy, but rather because the legislation would, quite simply, ruin the Internet. One blacked-out site on Wednesday won’t ruin the Internet—but it could ruin your day. If you absolutely need more information about, say, the Mojave Phone Booth, we can help. 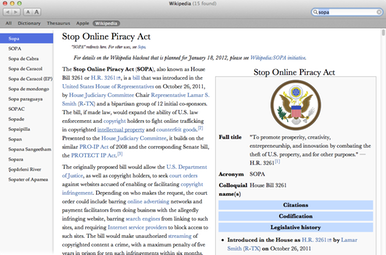 But before you work around Wikipedia’s SOPA protest, consider using its helpful utility to find your representatives, call them, and voice your opposition to the bill. Add a ?banner=false to the end of a Wikipedia URL, and the protest goes away, revealing the article you’re after. Since the mobile Wikipedia site is up, you can also force yourself to view the mobile-optimized site; change the en.wikipedia.org URL to en.m.wikipedia.org, and you’ll be good to go. Built into OS X is a Dictionary app—it’s right inside your Applications folder. Launch the app, click on the Wikipedia tab, and you can browse the site without difficulty. The Dictionary app works because Wikipedia (intentionally) left its third-party API access turned on. That means that any third-party app for Mac or iOS that browses Wikipedia content through its own interface—such as Wikipanion or Articles—should continue working just fine. If you’re fast, you can see the Wikipedia article you’re after without any workaround: Just hit Command-period (to stop the page from loading) as soon as you see the article, but before the blackout message appears.